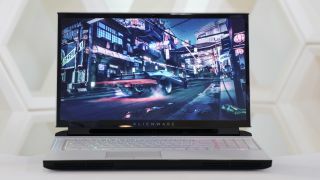 At CES 2019, Alienware announced the Area-51m, a gaming laptop that doesn't just pack the latest and greatest specs – it's also upgradable. The Alienware Area-51m is the latest flagship gaming laptop from Dell's gaming brand, featuring the new 'Legend' industrial design. Unlike most desktop replacement gaming laptops, the Area-51m has a clean black or white (with a black accent around the back) design. It's not just style, out of the box, the Alienware Area-51m will already be an impressive gaming laptop, with socketed desktop-grade Coffee Lake Refresh processors and Nvidia Turing graphics, that users can upgrade in the future. These processors will top out with the Intel Core i7-9700K and Intel Core i9-9900HK, which are the first eight-core processors to make it to a laptop. These powerful processors will be backed up with up to an Nvidia GeForce RTX 2080 GPU. It's not clear how the internal GPUs will be upgraded, but the CPU appears to be using a standard Intel processor socket. However, the Alienware Area-51m will be fully compatible with the Alienware Graphics Amplifier, which enables full-speed external graphics from either AMD or Nvidia. You can pack it with up to 2TB of SSD storage and 64GB of RAM, so the sky's the limit when it comes to performance, and all this powerful hardware will be powering a FHD (1,920 x 1,080) 144Hz G-Sync display with Tobii eye tracking technology. Now, when a gaming laptop comes out with desktop-grade components, cooling is obviously going to be a concern. Alienware hopes to address this with its new Advanced Cryo-Tech 2.0 cooling system. This cooling system will draw cool air from the bottom of the laptop, and exhaust the hot air through vents in the back and sides of the laptop. It doesn't end there, though. Backed up with a high voltage driving fan, the system can intelligently discharge heat across several heat pipes. Alienware claims that this setup will keep the desktop-grade components within their thermal limits. Understandably, all of this cooling to come at a cost to the dimensions. The Alienware Area-51m is a hefty device, weighing in at 8.54 pounds (3.87Kg), and measuring 1.7 inches (42mm) at its thickest point. Alienware hasn't disclosed pricing information at the time of writing, but the Alienware Area-51m will be hitting the market on January 21.